Guzmán was captured in Guatemala on 9 June 1993, extradited to Mexico and sentenced to 20 years, nine months in prison on charges of drug trafficking, criminal association and bribery. He was jailed in at Federal Social Readaptation Center No. 1, a maximum-security prison. On 22 November 1995, he was transferred to the maximum security prison Federal Center for Social Rehabilitation No. 2 (also known as “Puente Grande”) in Jalisco, after being convicted of three crimes: possession of firearms, drug trafficking and the murder of Cardinal Juan Jesús Posadas Ocampo (the charge would later be dismissed by another judge). He had been tried and sentenced inside the federal prison on the outskirts of Almoloya de Juárez, Mexico State. While he was in prison, Guzmán’s drug empire and cartel continued to operate unabated, run by his brother, Arturo Guzmán Loera, known as El Pollo, with Guzmán himself still considered a major international drug trafficker by Mexico and the U.S. even while he was behind bars. Associates brought him suitcases of cash to bribe prison workers and allow the drug lord to maintain his opulent lifestyle even in prison, with prison guards acting like his servants. He met his longtime mistress and later Sinaloa associate, former police officer Zulema Hernández, while in prison, where she was serving time for armed robbery.Hernández later controlled Sinaloa’s expansion into Mexico City, but her body was found in a trunk, carved with multiple Z’s, signifying Los Zetas, Sinaloa’s archrivals. 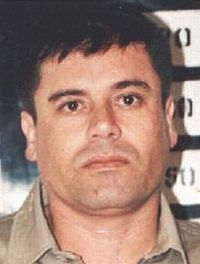 While still in prison in Mexico, Guzmán was indicted in San Diego on U.S. charges of money laundering and importing tons of cocaine into California, along with his Sinaloa attorney Humberto Loya-Castro, or Licenciado Perez (“Lawyer Perez”), who was charged with bribing Mexican officials on Sinaloa’s behalf and making sure that any cartel members arrested were released from custody. After a ruling by the Supreme Court of Mexico made extradition between Mexico and the United States easier, Guzmán bribed guards to aid his escape. On 19 January 2001, Francisco “El Chito” Camberos Rivera, a prison guard, opened Guzmán’s electronically operated cell door, and Guzmán got in a laundry cart that maintenance worker Javier Camberos rolled through several doors and eventually out the front door. He was then transported in the trunk of a car driven by Camberos out of the town. At a gas station, Camberos went inside, but when he came back, Guzmán was gone on foot into the night. According to officials, 78 people have been implicated in his escape plan. Camberos is in prison for his assistance in the escape. The police say Guzmán carefully masterminded his escape plan, wielding influence over almost everyone in the prison, including the facility’s director, who is now in prison for aiding in the escape. One prison guard who came forward to report the situation at the prison was found dead years later, presumed to be killed by Guzmán. Guzmán allegedly had the prison guards on his payroll, smuggled contraband into the prison and received preferential treatment from the staff. In addition to the prison-employee accomplices, police in Jalisco were paid off to ensure he had at least 24 hours to get out of the state and stay ahead of the military manhunt. The story told to the guards, being bribed not to search the laundry cart, was that Guzmán was smuggling gold, ostensibly extracted from rock at the inmate workshop, out of the prison. The escape allegedly cost Guzmán $2.5 million.